I was really interested in finding out more about how factors like small changes in distance or subtle variations in the speed of movement affect performance. It’s easy to spot when someone makes a bad decision in a fight – but it’s not so easy to figure out why. For me, that meant understanding the whole range of stimuli the taekwondo player is experiencing; and how those stimuli are affecting decision-making and action. He also maintains strong links with LSBU. Dave recently returned to the campus to deliver the traditional annual lecture to students on the Sport and Exercise Science and Sport Coaching and Analysis degrees, focusing on biomechanics and his experiences of coaching at elite level. 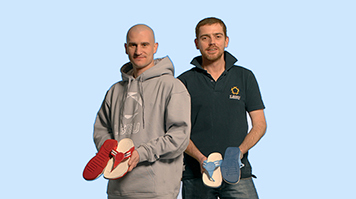 A joint research paper Dave published in 2015 with colleagues from the Sport and Exercise Science Research Centre in the reputable Clinical Biomechanics journal explored how FitFlops™ affect the gait. Dave is also co-supervisor – along with John Seeley and Darren James – for LSBU PhD student Bruno Striotto, whose thesis uses taekwondo as the starting point for a study of functional variability in combat sports. It is clear, too, that the time Dave spent at LSBU continues to exert a strong influence on his thinking. “My experiences as a lecturer, supervisor and researcher are absolutely integral to my development as a coach,” he says. It’s about helping individuals to realise their potential. I’ve always thought of myself as a facilitator rather than an educator. I was never interested in standing up there acting as if I knew it all. My aim has always been to get people thinking for themselves, whether that’s in the classroom or in the sporting arena. Sure, they might head off in another direction for a while. But sometimes it’s only by doing that that you really learn the right way to go. Find out more about Human Sciences at LSBU.